This classic, New England cottage-inspired Bookcase features two glass cabinet doors with graceful pine mullions! Handcrafted by expert Amish craftsmen, count on this superior closed-door bookcase enduring decades of use! Feel free to call with questions. 1-866-272-6773. The pine wood bookcase is Amish handcrafted in a classic Cape Cod rustic cottage look! 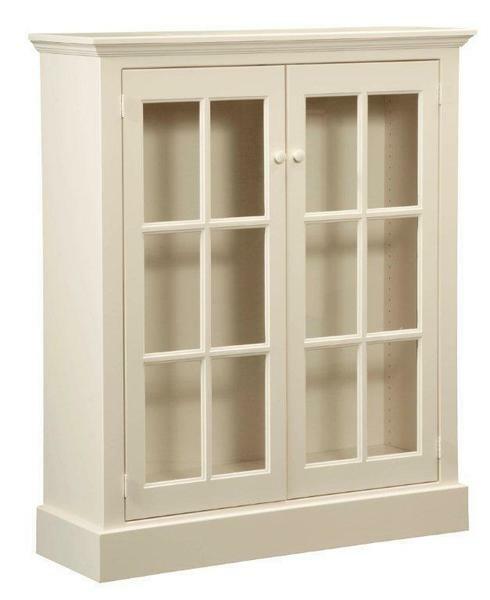 The Amish bookcase is shown in our beautiful country white painted finish. We also offer a wide variety of other paint and stain options. Please call to receive samples if you are trying to match or complement other office furniture.